We kickoff the first of a weekly series this football season looking at the weekend opponent for the Cowboys with Fritz Jarret of Sioux Football Insider . We hope it will help you know a little bit more about the North Dakota football team as they prepare to take on the Pokes in Laramie this weekend for the 2015 season opener. What are the expectations for the North Dakota football team this season? That is actually somewhat of a tricky question. The 2014 squad went 5-7 in HC Bubba Schweigert’s first year as head coach. All new staff, mostly all new terminology, expectations, etc. Their situation is very similar to Wyoming. The reason I say it is tricky is because there is no doubt the team will look better on the field. The “eye test” already looks better than a year ago. He brought in a handful of transfers and the freshman look pretty good, too. But, does that equate to wins? UND pulled out two games they very easily could have lost in beating RobertMorris 16-13 and Stony Brook 13-3 (92 yard defensive TD to seal it). If they lose those two they are 3-9 and “exceeding expectations” is much easier this year. We do believe they will be an improved team, not only in overall quality of play on both sides of the ball but in the win column as well. As most FCS fans know, 7 wins gets you in the playoff consideration and we think they could get to 6, maybe 7, with a little luck again this year. What systems does North Dakota run both offensively and defensively? Offensively, UND runs a very prototypical pro-style offense. They huddle every play, use the play clock, and try to slow down the game by methodically running the ball, moving the chains, and winning time-of-possession. About as opposite as you can get from today’s high-flying, fast paced offenses, like the one Montana showed on Saturday. They will employ a fullback and multiple tight-ends but at times bring in 4 wide receivers, as well. If they have success running the ball they will continue doing it all game and not worry much about the passing game. often throughout the game, when need be. With 4 linebackers on the field it gives them a lot of flexibility to pick their spots to bring pressure. This does leave the secondary susceptible at times and last season they got beat way too many times. They hoped to have shored that up by bringing in 3 FBS/Juco transfers at the safety and cornerback positions. UND has ran the 3-4 scheme since 1988 I believe. Who are a few standout players that Wyoming fans should look for? The UND offense doesn’t really have any standout players but is vastly improved, at least on paper, over last season where they struggled mightily to get much of anything going until around week 10. True sophomore QB Keaton Studsrud (6’1”-190) is the one everyone will be paying attention to on Saturday. He got thrown in to the mix last year as a true freshman and had his first start at the Inferno in Eastern Washington. It did not go well. He struggled for a few more weeks before starting to show signs in the last two games of the year, both of which UND won. He is a very good athlete who can run the ball when needed but will need to show improved accuracy now that he has settled in as the starter. UND brought in transfer WR Clive Georges from Arizona this past winter and he could be the play-maker they have been desperately missing the past couple years. He has great speed and quickness and will need to get the ball in space to do his damage. Defensively, ILB Will Ratelle is the leader of the defense. He is a rock in the middle at 5’11”-250 and should make a bunch of tackles vs. a run-oriented team like Wyoming. Sophomore safety Cole Reyes is probably the best athlete on the entire roster. 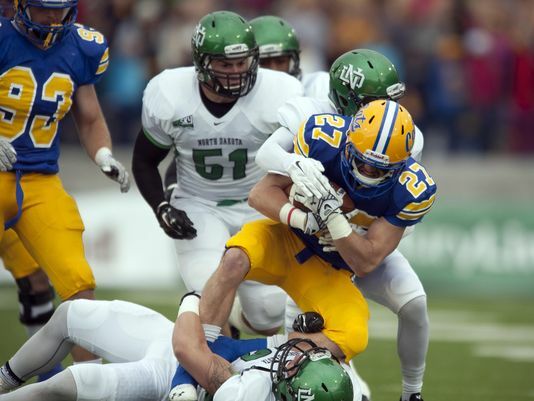 At 6’2”-225, he is imposing figure back there and could be a bigtime difference maker for UND. Reyes is a big hitter while also fairly good in coverage as well. He needs to take the next step this season. With North Dakota having moved to the Big Sky and FCS in 2012, how has the transition been so far? The transition has not gone all that well. In their three years of Big Sky play, they are 8-16 overall. UND fired Coach Chris Mussman after the 2013 season and replaced him with Bubba Schweigert, who previously coached at UND from 1988-2003 as a defensive backs coach and defensive coordinator. Last season under Schweigert UND went 3-5 in the conference but finished first in total defense and 3rd in points allowed. They are hanging their hat on defense and trying to win games the old fashioned way. UND realized real quick that they needed bigger, faster athletes in the secondary if they were going to compete in the Big Sky. This led to a lot of turnover at the safety and corner positions but they are much deeper than they were a year ago. The strength of the UND defense last season was vs. the run (allowed 102.5 yds/game) and we expect that to be the strength again this year. Should make for an interesting matchup on Saturday vs. Wyoming’s outstanding running backs. What is the latest on the nickname situation? What are your views on the change? Everyone loved and/or respected the name/logo, and I mean damn near everyone. However the hypocritical, self-righteous governing body known as the NCAA has deemed social engineering to be part of their mission and unfortunately has rendered UND pretty much helpless in this situation. We fully understand that they have been essentially forced to move on, but it still stings in a lot of different ways for many, many alumni, fans and students. The process has gone on way too long and it seems as if (some)people are ready to let UND move forward as a university and no longer have to deal with this issue. It has been going on for 30+ years, with the latest NCAA tussle going on for over 10 years. Jake_Blackson We’ll have those blogs every week, hopefully.